Spray an even coat of cooking spray on dish. Place fish in cooking dish. Add salt and pepper on the fish (both sides). Mix zucchini, olives, capers, and tomatoes in a bowl. Drizzle olive oil over this mix. Pour over salmon. Bake in oven at 425° for 30 minutes. Enjoy! Not only is this dish delicious, but it is also heart-healthy. It has iron, fiber, and is a good source of protein. 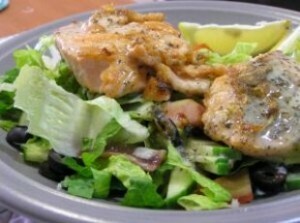 This dish also has the all-important Omega 3 fatty acids which protect the heart. A tasty dish that brings health benefits is a two-for-one deal that everyone can enjoy.